I received 431 emails that didn’t make it all the way to my inbox in the past month. I don’t know how these senders got my email or why they think I’m DTF or know that I’ve been waiting to hear from my long-lost wealthy Nigerian cousin for over a decade. Unfortunately, a lot of potentially really good stuff gets caught in my spam filter. I say “potentially” because I don’t open it, even though, looking through my 431 spam emails, Neil Patel’s “5 Ways to Use Content to Get More Sales” email and Social Media Examiner’s “6 YouTube Tips to Improve Your Search Rank” is likely stuffed with great information. But I’ll never know. They didn’t get past my spam bot. One click, and my spam folder is empty. I can hear the soft howl an overworked marketer whoosh outside. Sorry for deleting your email, buddy. The unfortunate truth is that because those emails were written for me, they didn’t get past my computer. In fact, a recent article from Advertising Age argues that you should be writing your emails and articles specifically for the bots. Machines are very good at tracking things (inventory, purchase history, etc.). If we want to sell to modern consumers, we need to make sure the machines think it’s a good idea. Of course, that doesn’t mean we’ve given up all control. You can decide to change detergent brands. You could choose to eat fast food every day, but your AI fitness trackers will explode while you do it. Machines ultimately answer to us. But knowing how to talk to the machines, and how they talk to people, is one of the most important challenges in modern marketing. No one advocates ignoring 50 percent of a potential audience, yet that’s what marketers do by ignoring machines. Whether content marketers admit it or not, we’re already writing for the machines–and we should be grateful for it. When we create headlines, excerpts, introductions, links, and metadata we’re not just thinking about the end reader. We’re telling search engines how to interpret our data. …So far, RankBrain is living up to its AI hype. You would think that content marketers would open their arms wide to search-based AI. We love when consumers are directed to the right answers and higher-quality articles, right? Especially when our respective brands are providing that content? 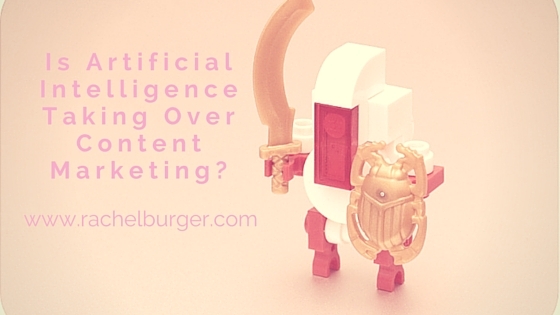 But the thing is that content marketing is already changing, and if we’re writing pieces that could already be written by bots, we’re not doing our audience justice. Computers can already draw, write, and even “dream,” but they lack the nuanced analytic decision making that humans can offer. A bot is never going to be as good a storyteller as a human. It has no grasp of emotion, suspense, or relief, and such basics for a good, let alone great story will always be vacant from a robotic author. A bot doesn’t have the creative spark that humans have. They cannot detect the needed flaws for people to enjoy reading, just as they can’t create a perfect musical composition. A bot cannot be a thought leader. As Contently is quick to point out, qualitative data interpretation is still best left to people. And finally, a bot cannot “thin slice.” While Blink: The Power of Thinking Without Thinking is almost a decade old, its message is one for all of humanity. Feelings and decisions made by “gut reactions” are oftentimes right, but absolutely impossible to quantify why. The gut, the “je ne sais pas” of being human can only be measured–and thus programmed–to an extent. Artificial intelligence will not ever be able to compete with it because even humans don’t know–and can’t know–how it works. Content marketers should focus on the benefits that artificial intelligence offers. A good search AI discourages spammy marketing–just as I don’t want spam ending up in my inbox, I don’t want it in my search either. Machine learning can offer lightning-fast research in a clear, organized manner (like these Mozbar hacks). Let AI do the heavy lifting for you. At its worse, it will replace interns. At its best, it will provide a better customer experience. So long as you can offer quality, analytical content to your readership, your job is safe. I think the savvy audience members will fight back with automation of their own. Recently I had a marketing company run amok with my email subscription. They replicated my business address across 5 of their databases. I was getting sometimes 3 marketing emails a day. Each time I clicked unsubscribe, I seemed to drop off 1 database briefly — then I suspect get re-replicated onto all 5 databases. I winged on Twitter and got a genuine response. But the change wasn’t complete. I finally set up a very primitive automation – an email inbox rule. When email comes from their domain, reply "UNSUBSCRIBE" and send to trash. (Do not pass go. Do not collect $200.) I now get emails 1-2 times a month from their customer service trying to track down the errant email addresses. By the way, do NOT use your real work email to subscribe for anything. I know many email marketing databases will no longer take subscriptions to domains like gMail or Yahoo. Instead set up a second business email address just for the subscriptions. Why? I use my mobile phone to access email from clients and I work internationally. My mobile data rates are prohibitively expensive. This is such a major problem my small business owners are having – especially in reaching their brand new clients. Great article Rachel, thanks!